The Nagoya City Hall main building was built to commemorate the coronation of the Emperor. The exterior design was chosen by calling for public entries, and, together with the Aichi Prefectural Government Building next door, is a fine example of the imperial crown style. The 53m central tower features a two-tiered roof, while the edge of the top roof features a shachihoko (a legendary imaginary beast with a tiger's head and a fish's body) glaring in all four directions. Indeed, the building is in harmony with Nagoya Castle. Inside, the marble used in the entrance hall and stairs is Kozakura from Yamaguchi prefecture left over from the National Diet Building. 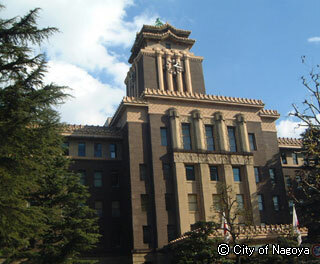 The Diet and Nagoya City Hall are the only buildings to use this material. Incidentally, the use of a rare roundtable style in the main municipal assembly chamber, as can be seen straight ahead at the rear of the building, was out of the hope that Nagoya's city politics would be similarly smooth.